Le webcam sono spente ed i Falchi hanno già abbandonato il nido, in attesa della prossima stagione riproduttiva vi lasciamo con due splendide immagini. 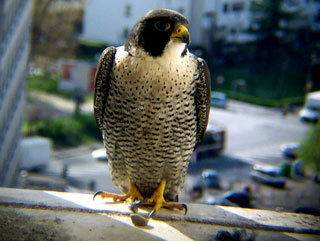 At the beginning of season 2005, two web-cam devices were put in order to monitor nest activities within a niche at thirteen floor of skyscraper number 38 ( Bologna Fair District ), used by peregrine falcons (Falco peregrinus) as a breeding site. 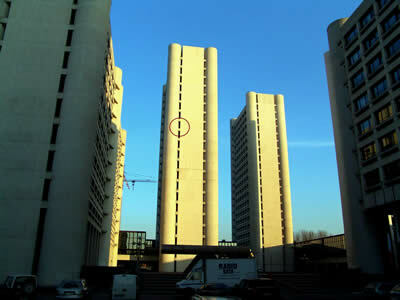 Remembering the lonely case in Milan (1994), the regular exploitation of one of Bologna Kenzo's Towers from the year 2000 by nesting peregrine represents the first example of non-sporadic breeding in urban habitat assessed in Italy so far, even if notices of presence of this falcon during breeding season in so many towns over the last few years make nesting possible elsewhere even if not yet checked. 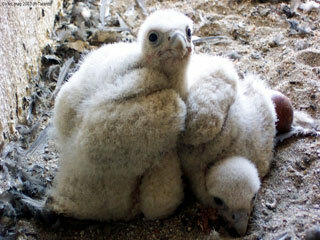 Contrary to what happens in Centre Europe and North America, the settlement in urban habitat of our country depicts a natural fact not linked to releasing of captivity-breeding falcons to re-introduction. Web-cam devices has bought by " Servizio Apicale Tutela e Sviluppo Fauna " of Bologna Province and their installation was possible by means of Regione Emilia-Romagna Administration, which we publicly thank. The surveillance of nest-site during the most critical period will be carried out by staff of Bologna Province Police Force .